Jeffery Johnson was born in Bury St. Edmonds, England. As a military dependent he and his family were often mobile until settling in Fayetteville, North Carolina in 1996. 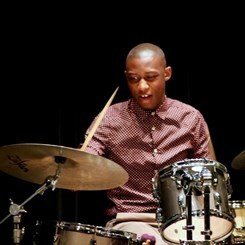 He began playing the drums at age 7 and was heavily influenced by the gospel style of music. Though his musical dexterity began to increase, he did not learn to read music until he reached high school. While in high school he was an essential member of the concert band, and served as a leader in the percussion section, as well as head drummer in the pep band. Jeffery furthered his music education at The University of North Carolina at Pembroke where he was taught by Daniel R. Davis. Jeffery received a bachelor’s of art in music with a concentration in Jazz studies. While he attended UNC Pembroke he was a part of the marching band, pep band, jazz ensemble, and various Jazz combos, including the UNCP Jazz Combo #1 who has toured across the state of North Carolina teaching high school band students about Jazz. The main focus of his education was learning to play multiple music styles like Jazz, Latin, Funk, Rock, etc. As a student, he thrived as a freelance musician playing of various Gospel, Jazz, and R&B events across the state of North Carolina. He now performs and teaches regularly in Fayetteville.